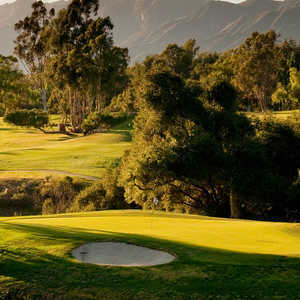 OJAI, Calif. -- When it comes to thinking about a getaway in southern California, it is important to remember the region, which runs from Santa Barbara to San Diego and stretches inland 80 miles or so (a total of about 1,600 square miles), contains 22 of the state's 36 million people. Ojai Valley Inn & Spa: an intensive detox unit for those overwhelmed by SoCal congestion. If it were a state it would rank just behind Texas but ahead of New York. There are times when it seems the entire place is freeways, traffic, strip malls and endless population, which can be overwhelming. The best antidote for that can be found at the Ojai Valley Inn & Spa, located about 80 miles northwest of central Los Angeles. Consider it an intensive detox unit for those overwhelmed by southern California congestion. Located off the main street of Ojai, the first impression of the resort is the white stone welcoming sign and then acres of green grass. Bellhops graciously offer cold water for those who appear a little frayed from the drive, and then direct you to the reception desk. The resort contains 304 rooms of classic Spanish Colonial architecture spread graciously over the rolling landscape, large oaks and eucalyptus, providing welcome canopies of shade. Walking about the resort entails ascending and descending Spanish tile steps in a series of staircase and patio excursions, which gives off a southern Spain vibe. Immediately you can feel the stress fade. Many of the rooms offer expansive views of the mountain ridges and valley. The rooms are modern but stylish with a Spanish decor. The feel is comfort and quiet. And as alluring as it may sound to decamp indoors, that negates the best part of the Ojai experience. Located in a valley near the Los Padres Mountains, the resort basks in the best of Southland weather -- dry and still but with enough influence off the ocean as not to be oppressive, even on the hottest summer days. It's the nights that make Ojai -- calm, warm, quiet with something added that's missing in the more populated basin: Stars, which get blinded by the light pollution. Many of Hollywood's past and current stars have lived in the town of Ojai. Whether you're dining outdoors under the vines of the resort's Oak Grill, or coming out from the stately Marravilla, you'll find guests just sitting and relaxing in the evening splendor. With a second glass of wine reflecting the soft golden light, it's easy to feel the glamorous glow of a simpler time -- slower, calmer, quieter, the imposing terrain providing a defensive layer from the pressure of everyday life. De-stress activities start with Ojai Valley Inn's world-class spa that offers everything from body wraps to body hoops. Need something more personal? Contact the spa staff and they can conjure a private mind and body session that can include meditation or fitness walks through the mountains. If the artistic urge hits you, you can spend a couple hours in the artist's cottage getting your Van Gogh fix. For me, I got my George Thomas fix. 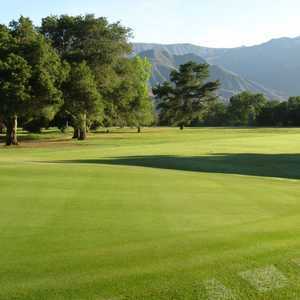 The man whose course design credits include Riviera, Bel Air and Los Angeles country clubs laid out the golf course at Ojai Valley Inn & Spa with Billie Bell in 1923 that might be the most fun but challenging course I have ever played. This course is split into two distinct sections, with holes 1-9 as well as 15-18 running to the south and west of the resort. Holes 10-14 are on the north side, on the other side of the hotel and restaurants. The front nine is more open but the hilly terrain created perfect short par 4s for Thomas, who excelled at bunkering and challenging green complexes. From the back tees, the first four holes measure 373, 358, 119 and 297 yards. None are easy. Missed approaches tumble into woods or down steep slopes or into the sticky kukuyu grass. The fifth, a 440-yard par 4, looks imposing but it starts with an expanse drop from tee to fairway, aiding one's need for more distance. On the sixth and seventh holes you're in the wild, with eucalyptus and oaks bordering the small valley. Thomas' bunkering creates splendid visuals on the approach shots, and the lush grass contrasts sharply with the rugged scrub on the mountainsides. The par-3 eighth and par-5 ninth round out the front. A 4-3-5-4-3 run comprises the first five holes of the back. The long and straight par-5 15th leads to the best part. Nos. 16 and 17 are known as the "lost holes," because they were used for training exercises during World War II. Seven bunkers in front guard the 16th hole, a downhill 180-yard par 3. The amazing 430-yard 17th rises uphill with fairway bunkers left, a tree-covered No Man's Land to the right and more steep, deep bunkers in front. It's a par-70 course that can't break 6,300 yards and even the longest hitters would play it every day. It has hosted seven Senior PGA Tour events, many high-profile amateur events, but it's not too hard to conjure up what it must have been like in an earlier age when Bing Crosby and other Hollywood stars would visit regularly to play the course.